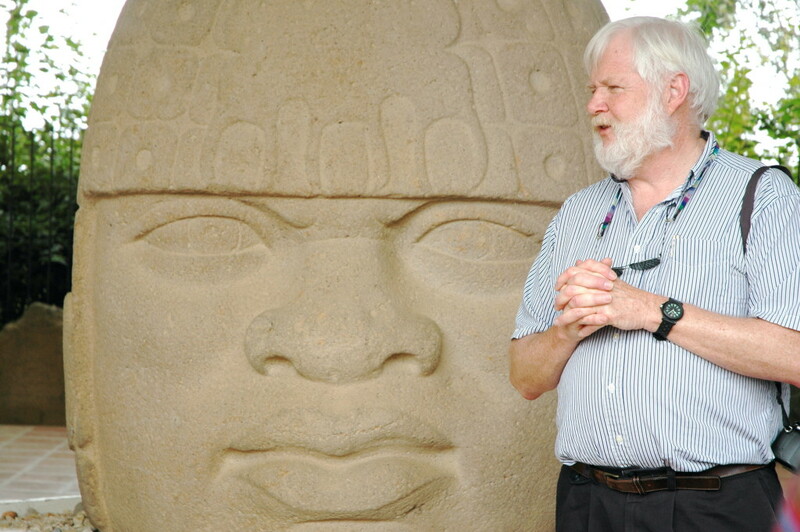 Professor Henderson speaking to an Archaeological Conservancy group at San Lorenzo site of the famous Olmec Stone heads and earliest of the great Mesoamerican Cities. Photo Courtesy John Henderson. Nestled in a tropical paradise, lost cities, unique architecture, and archaeological sites that defy current cultural classification await our arrival. Joining us will be Dr. John Henderson, noted scholar on the Maya and Professor of anthropology at Cornell University. Read blog “Traveling Professor Henderson’s World of the Ancient Maya“. Travel along on our 2018 trip read and watch video of the stunning Cantona site “Veracruz: Gateway to Mesoamerica – Travelogue” ! Thursday, January 11 Join us for a welcome reception in Veracruz, where we’ll spend the next two evenings. We’ll explore the city of Veracruz, founded in the early 1500s after Hernán Cortés landed at Villa Rica just north of the city. We’ll also visit the Castillo de San Juan de Ulúa, a massive Spanish fort constructed beginning in the 1530s. In the morning we’ll see La Antigua, the original site of the city of Veracruz, as well as Villa Rica, the probable landing site of Cortés in 1519. In the afternoon we’ll visit the Xalapa museum, which contains the world’s best Olmec collection. We’ll spend the next two evenings in Xalapa. We’ll travel to Cantona, which was occupied from 100 B.C. With a population of 40,000, Cantona flourished following the collapse of Teotihuacán, and may have affected Teotihuacán’s access to the Gulf Coast. The site contains 24 ball courts and almost 3,000 residential terraces. At Zempoala, a Totonac site dating from A.D. 1000, we’ll view a cluster of pyramids and unusual circular structures. We’ll visit Quiahuiztlan, a Totonac site with Toltec-style features dating to around A.D. 1300. We’ll spend two evenings in the bustling commercial center of Poza Rica. We’ll visit El Tajín, the famous Totonac capital occupied between A.D. 500 and 1200. Containing 17 ball courts and a number of pyramids and structures, the early constructions feature distinctive Teotihuacán-style influences that include frets, scrolls, and images of Quetzalcoatl. We’ll visit the Late-Huastec/Post-Classic Castillo de Teayo, constructed around A.D. 1300 and occupied until historic times. We’ll return to Veracruz and spend the evening. 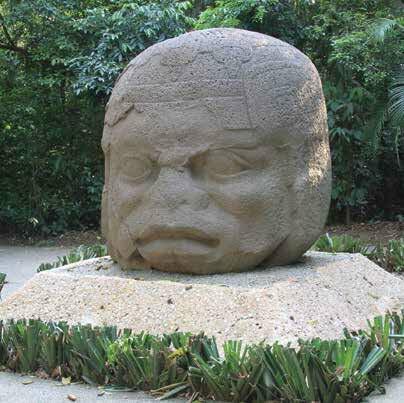 We’ll visit Tres Zapotes, where the first Olmec colossal heads were discovered in 1869. Without an archaeological context to classify these unusual stone carvings, there was much speculation in the late 1800s about an African origin. Matthew Stirling’s pioneering work in 1939 demonstrated that Tres Zapotes was occupied from about 500 B.C. until A.D. 200, at the end of the Olmec period and into the transition period from Olmec to Maya. We’ll also visit the museum at Santiago Tuxtla. We’ll travel south to Minatitlan where we’ll spend the next two evenings. We’ll tour the Olmec center of San Lorenzo, which dominated the region from 1200 to 900 B.C. and was first excavated by Stirling in 1945. On our way to Villahermosa, we’ll explore the Olmec site of La Venta, which was first occupied before 600 B.C. In Villahermosa we’ll visit the Parque-Museo La Venta, a magnificent outdoor sculpture garden that displays some of La Venta’s most significant artifacts. We’ll spend the evening in Villahermosa. Participants depart for home from Villahermosa. Tour Details – Cost includes hotel accommodations based on double occupancy (single supplement is $325), meals as indicated, happy hours, admittance fees, tips, tours, background reading, airport transportation and surface travel via air-conditioned bus. Not included are meals other than those indicated and transportation to Veracruz and from Villahermosa. NOTE: A modest amount of walking is required. Ruins have rubble, undeveloped trails, and steep stone stairs. Olmec Head. Photo Jim Walker/Archaeological Conservancy.